Manufacturer of a wide range of products which include double foot step stool ss, double foot step stool ms, single foot step stool ss and single foot step stool ms.
A huge range of Double Foot Step Stool SS is offered by us to customers in various sizes. This Double Foot Step Stool SS is manufactured by using good quality raw material and advance technology. The offered Double Foot Step Stool SS is extensively used in place of a visit, consultation, or advice of a legal, etc. Our products are available in the market in bulk. The best quality of Double Foot Step Stool MS is offered by us to customers in bulk. The offered Double Foot Step Stool MS is available in the market in huge range at most affordable rates. 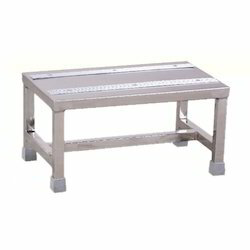 The offered Double Foot Step Stool MS is extensively used in Hospital, Doctor Clinics its chrome plated handrail provides additional support and safety. Our products are easy to use. The best quality of Single Foot Step Stool SS is offered by us to customers in bulk. The offered Single Foot Step Stool SS is known for its supreme quality and durability. 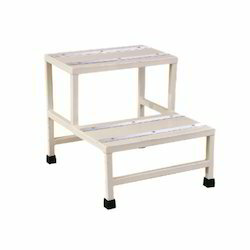 The offered Single Foot Step Stool SS is extensively used a stool like this in the hospital and it worked wonderful. Our products are quality approved. A huge range of Single Foot Step Stool MS is offered by us to customers in bulk. 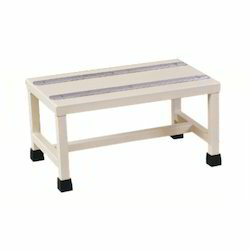 This Single Foot Step Stool MS is known for its high performance and high durability. Further, the offered Single Foot Step Stool MS is extensively used one of these step stools for several years and found it useful and reliable. Our products are available in the market in wide range.